The Harris Museum, Art Gallery and Library in Preston has a long track record of partnership working with the University of Central Lancashire (UCLan). During the last twenty years this has taken many forms from placements and paid internships for students to the development of joint artistic programmes between the two organisations. In Certain Places was set up in 2003 as a joint initiative between the Harris and UCLan to explore place-making in Preston in the context of the regeneration plans for the city. ICP created numerous popular art interventions around the city, from Jeppe Hein’s interactive fountain sculpture Appearing Rooms on the Flag Market in 2006, to the Harris Flights, which created a flight of steps leading up to the Harris balcony as the setting for a programme of performances through the summer of 2013. Harris staff have regularly been involved in the delivery of a variety of courses at the University, including Marketing, Events, History, Art, Fashion and Architecture. Key partnerships have developed with Art and Fashion lecturers, leading to exhibitions featuring both students’ and academics’ work, and with the UCLan-led Preston History Network, which brings together local historical organisations to promote events such as the Guild 2012 and Heritage Open Days. In 2014 a piece of research was commissioned to scope existing links and the potential for future joint-working. This identified barriers such as information sharing and different working patterns through the year, and led to the development of new contacts to overcome these. Now however Preston is in the process of major regeneration and both the Harris and UCLan are in a period of massive change. The Harris needs to reposition itself if it is to keep pace with the redevelopment going on around it in the city centre, and to meet the needs of an increasingly diverse population in Preston and Lancashire. The Re-Imagining the Harris programme was set up in 2015, and has developed an innovative vision which will shape its repositioning. This envisages the Harris as the cultural and community hub for Preston. 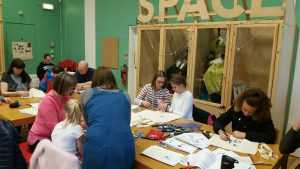 A community led organisation that acts as the civic focal point for the city centre, constantly animated with creativity at the core of everything it does. UCLan has grown at a rapid rate, it is now the 8th biggest University in the country, with more than 38,000 students with campuses across Lancashire, and in China. However it recognises Preston as its home, and has developed a masterplan which will see £200 million of investment in the city campus during the next ten years. This campus sits on the edge of the city centre and the masterplan is integral to the wider regeneration of Preston. A vibrant Preston is key to realising UClan’s ambitions, in order to attract prospective students and entertain existing ones. The University is keen to develop stronger and more tangible links to the city centre to contribute to the animation of the city, and to create stronger links with existing communities across Preston. The Harris provides the perfect partner for the University in developing this city centre presence, and it is this that has driven recent moves to a more co- ordinated and strategic partnership between the two institutions; as well as a wider recognition that the ambitions of the Harris and UCLan are inextricably intertwined. Therefore the relationship between the Harris and UCLan is moving to a different level. A member of UCLan’s executive team (the Pro Vice Chancellor of External Relations) will sit on the Project Board for the Re-Imagining the Harris project. The University will play a pivotal role in shaping the repositioning of the Harris. In the short to medium term the two organisations are working together to ensure that UCLan adds significant value to the day to day running of the Harris, and has a tangible presence in the building. The best example of this is the recent development and installation of a Makerspace in the Harris. The idea emerged after discussions between senior staff in the two organisations and was driven by the desire at the Harris to put creativity and making more at the core of what the building does, alongside the expectation at UCLan (and particularly at their Media Innovation studio) that they needed to be engaging more proactively with the hardest to reach audiences in Preston. of the Makerspace. 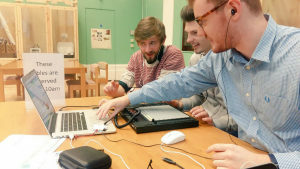 Since it opened in the autumn of 2016, the programme has been varied, with Harris and UCLan staff, alongside members of the local community and artists, offering a wide opportunity to make and create, from costume making to coding and from drawing to drones. There are plenty of other examples of the Harris and UCLan working together to deliver the new vision for the Harris, and the wider ambitions of the University. The Heritage Network at UCLan has recently organised a series of sold out talks at the Harris, reinforcing the message that the building is a centre for discussion and debate. The Harris will also host the University’s graduation show and related events in early summer that will animate the building, and enable the people of Preston and Lancashire to appreciate the potential of the thousands of students the city hosts. So in recent years the partnership between the Harris and UCLan has matured, driven by the regeneration of the city and the challenging environment the two organisations find themselves operating in. The relationship, which had originated in a mutual shared appreciation of learning, heritage and the arts, is now evolving into a robust partnership where each organisation is becoming a key contributor to the other’s wider ambitions.